Lucerne Pro Equifibre is a highly nutritious and palatable fibre supplement to complement every feed regime, grown and produced in New Zealand. Lucerne Pro is a nutritious fibre feed with a medium energy level. It contains naturally occurring vitamins and minerals found within our high quality lucerne. Adding Equifibre to your horse or pony feeding program, will aid with feed utilisation through provision of a healthy digestive system. 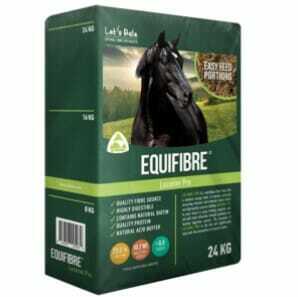 The inclusion of Equifibre to the diet will assist in maintaining healthy gastric pH levels. Lucerne Pro Equifibre is a highly nutritious forage fibre made of quality lucerne. The Lucerne is cut and pressed into convenient block sized portions for ease of handling, and vacuumed sealed to enhance nutritional quality and freshness. Being completely dust free with a high moisture content, it helps to keep horses hydrated and enhances feed palatability. When added to your regular hard feed, Lucerne Pro slows consumption and encourages chewing which increases saliva production and therefore can assist in maintaining optimum gastric health. Lucerne Pro Equifibre contains natural beneficial yeasts and is rich in Vitamin A & E, with good levels of available calcium. The addtition of Lucerne to the diet is well researched for its ability to maintain good gastric pH levels and therefore reduce the likelihood of adverse gastric conditions. Equifibre Lucerne Pro is cut and pressed into convenient block size portions for ease of handling. There are 3 blocks in total, each approximately 8kg in weight. The blocks are pressed in layers and are easy to extract out of the bag. The lines on the left hand side of the bag present how many kg’s are left. By knowing the weight of the blocks through the guide on the side of the bag and using the feeding recommendations, Equifibre will help to ensure general health and optimal feed utilisation.